Minister Delegate for European Affairs George Ciamba had a meeting with ambassadors of EU member states accredited in Bucharest on Thursday, November 22, 2018, organized by the Embassy of the Republic of Austria in Romania in the context of the Austrian Presidency of the EU Council. Minister Delegate for European Affairs welcomed the objectives of the Austrian Presidency and the efforts made to meet the established priorities. The Romanian official stressed Romania’s commitment to ensuring the continuity of legislative dossiers important for the European agenda during Romania’s forthcoming presidency at the EU Council. Minister Delegate assured EU ambassadors that Romania is ready to take over the presidency of the EU Council, emphasizing the role of the Ministry of Foreign Affairs in coordinating the preparations at national level. 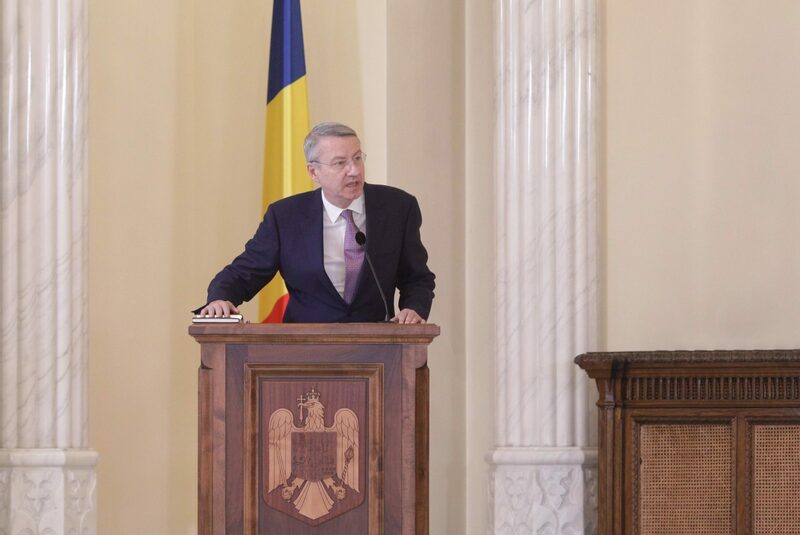 He also pointed out that the Romanian side has an intense dialogue with the European institutions, with its key partners and the Trio of Presidencies Romania will be part of, in order to ensure the necessary coherence in the implementation of the agreed strategic priorities at regional and European level. He emphasized that the Romanian Presidency of the EU Council will follow a pragmatic approach to deliver results that can bring real benefits to European citizens. The minister stressed the importance of the informal Summit in Sibiu, to be held on 9 May 2019, to convey a political message of unity from European leaders. In the context, he pointed out that Romania is ready to act effectively for the advancement of the major legislative files on the European agenda, especially during the first three months of the Romanian Presidency, in view of the elections for the European Parliament scheduled for May 2019. Mr. Ciamba stressed the importance of the informal Summit in Sibiu, to be held on 9 May 2019, to convey a political message of unity from European leaders. In the context, the minister pointed out that Romania is ready to act effectively for the advancement of the major legislative dossiers on the European agenda, especially during the first 3 months of the Romanian Presidency, in view of the elections for the European Parliament scheduled for May 2019. In this regard, he mentioned that Romania will act as an honest broker to continue the negotiations on the future Multiannual Financial Framework 2021-2027, aiming to focus on issues of common interest for the EU member states. The Romanian official also pointed out that at the level of the Ministry of Foreign Affairs and the relevant national institutions all necessary logistical and protocol steps are taken to ensure a good organization of the meetings hosted by Romania during the Presidency of the Council EU.